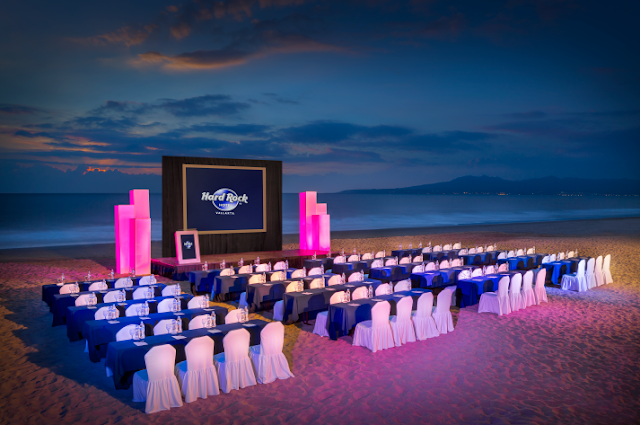 The Hard Rock Hotel Vallarta is the only hotel in the Riviera Nayarit to receive this award that pays tribute to the most outstanding hotel event catering departments according to the readers of M&C. Nuevo Vallarta’s Hard Rock Hotel Vallarta (HRHV) has been singled out by the readers of Meetings & Conventions (M&C) as the winner of the 2016 Gold Platter Elite Award, the only one to received this recognition in the Riviera Nayarit. This award pays tribute to the most outstanding hotel event catering departments according to the readers of the M&C who have the certified criteria necessary thanks to their ample experience in the segment. Some of the elements considered when choosing the winners were: menu creativity, originality, personnel enthusiasm and professionalism, ambiance, and the quality and flavor of the food. This year 40 establishments received this award after online voting was counted. All the winners will be included in the M&C Annual Gold Awards special edition magazine, which will be published by November 2016 both in hard copy and online; it will directly reach 50 thousand readers and be available for an entire year.